Ministering to the elementary child is a joy. But keeping the interest of today’s technology-saturated kids takes a lot of creativity. On this page you will find several categories of Sunday School resources that are created just for the grade school student. They will provide you with lots of great ideas and visuals which will ultimately give you a dynamic and disciplined classroom no matter the age groups you are dealing with. Prayer and preparation are the keys. Add them to these activities and each week you will look forward to teaching the children God has placed under your care. The first category presents Bible object lessons. One of the best way to get your children’s attention on a Biblical topic is by presenting a Bible object lesson. These are Christian Bible lessons for kids at their level of understanding using today’s objects for teaching key points. The second category highlights games for specific Bible verses. Focusing on a single Bible verse or passage of Scripture can be very effective when teaching a truth of God. Adding a fun game to your task will delight both the children and you as you introduce each of these games. The third category showcases games for Scriptures that follow a theme. 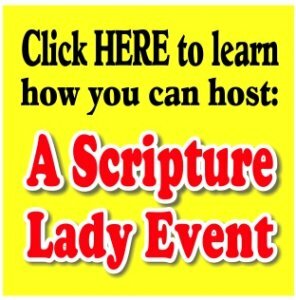 The Bible is filled with various themes and The Scripture Lady has so much fun coming up with creative ways to share these themes such as miracles and promises in the Bible or verses on the light of God. The fourth category showcases Bible acrostics and outlines for Christian kids. Every word in the Bible is important, especially the heavy-hitters like discipleship and grace. Using acrostics is a really fun way to explore the meanings of these words. Outlines are perfect for studying key points in the Bible, such as the resurrection and the meaning of the cross. The sixth category presents retellings of some of the major Bible stories at a child’s level. These stories are not meant to take the place of the reading of God’s Word, but are meant to enhance the meaning for a child’s understanding. The seventh category gives Bible memory verse activities for the elementary child.. Memorizing is not easy for many people and kids are no exception. Here are some very fun and effective memory verse activities to play with your kids to help them hide God’s Word in their hearts and minds. The eighth category presents holiday Bible lessons. All kids LOVE the holidays! So, make it these days even more special by presenting fun Bible activities for children that bring out the Biblical truths of the holiday. You will find several ideas for many of the major holidays and the list will continue to grow. The ninth category showcases a creative way to have fun with Bible verses. We call them “Scripture Pictures.” Using the rebus form of writing, we take Bible verses and match up pictures for each of the words and ask the kids to put on their thinking caps to read the verse as it should be. Very visual and very fun!